The thing I love most about Thai cooking (other than devouring the end result) is how incredibly easy it is. Very few recipes call for techniques more advanced than basic knife work, mixing, and stir-frying. Maybe that’s why I never really got into French cooking; it’s simply too much work! Plus I don’t like French food. Once you have the basic methods down for making a stir-fry, soup, fried rice, and curry you can exercise your own creative tendencies and make just about anything you like. The majority of recipes calling for curry paste can easily be adjusted to accommodate whichever kind you have in your cupboard. I try to keep five different varieties on hand: Red, Green, Yellow, Massaman, and Panang. 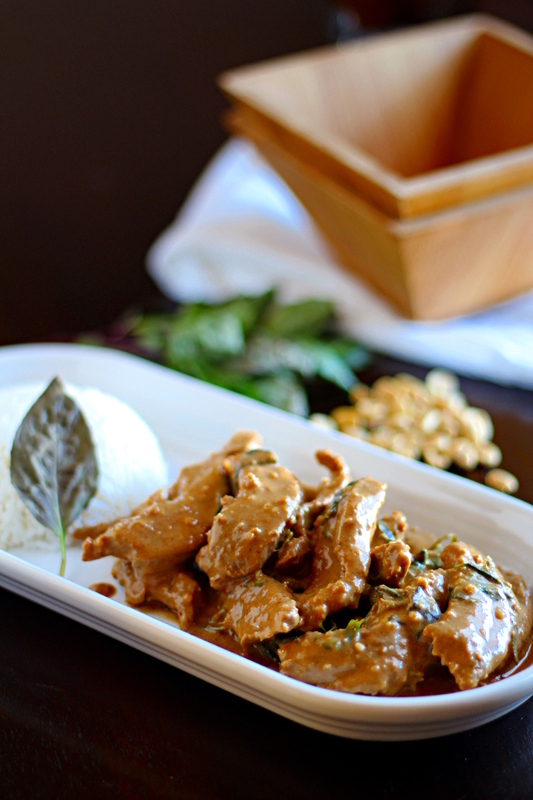 This Peanut Panang Beef Curry is delicious, simple, and richly satisfying. While I’ve listed traditional Thai ingredients below, I’ve also included substitutions for those without access to all of the items listed. You’ll want to serve this dish with rice to soak up all of the peanutty-goodness, so be sure to get a pot going before you start on the beef as the curry comes together very quickly. See my tip below about using the leftover coconut milk to make the rice! A green salad on the sides makes this a complete meal. Pour a half cup of coconut milk into a wok or skillet set over medium-high heat. Once hot and foaming, add the Panang curry paste and use the back of a wooden spoon to break apart any large chunks. Stir the curry paste and the coconut milk until fully combined. Reduce the heat to medium and add the rest of the coconut milk as well as the water, fish sauce, palm sugar, and lime leaves. Let simmer for a few minutes then add the thinly sliced beef and stir. Cook the beef, stirring occasionally, for 3 minutes. Add the ground peanuts and reduce the heat to low. Stir to combine the peanuts with the curry. Just before serving, turn off the heat and remove the wild lime leaves. Add the basil leaves and stir. Serve with rice. *When I have a recipe that calls for just part of a can of coconut milk, I like to use the leftovers to replace part of the water used to make rice. It really adds delicious flavor and texture to the rice and keeps me from finding wasted Tupperware containers of coconut milk in the back of my fridge. ** Substitute red curry paste or Massaman curry paste if you don’t have Panang. *** Use brown sugar if you don’t have palm sugar. **** Wild lime leaves make all the difference in the world, but the curry will still taste delicious without them. If you can’t find any, substitute 1 Tbsp. fresh lime juice. If using lime juice instead, add it at the very end along with the basil. ***** I threw some peanuts in my food processor until ground, but you could also use regular peanut butter. This sounds great, really simple, I love your stews. 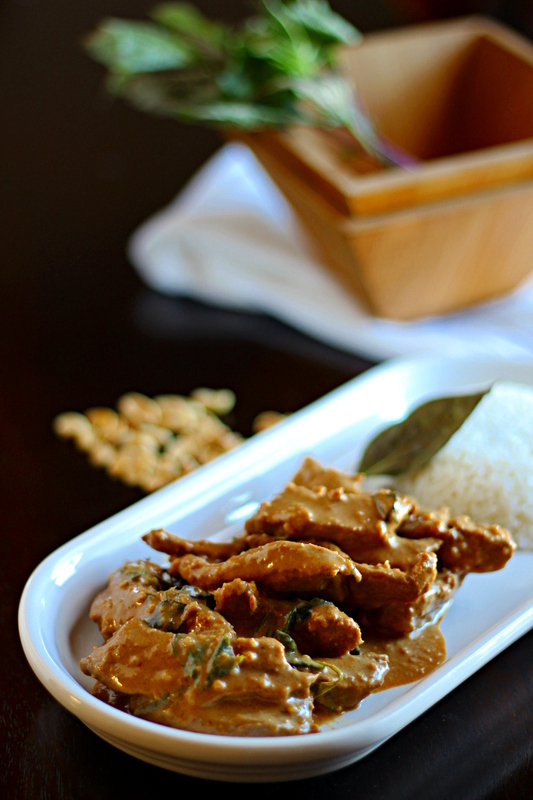 I just adore panang curry- I daresay it may even be my favorite variety. The sauce here sounds incredible, and I would happy slather everything from tofu to corn on the cob with it! A very tasty & lovely looking dinner! MMMMMMM! Without question, you have the most informative food blog of all I subscribe to! Just5 exceptional recipes from all over the World! Simply the best! !